Tune in to the frequency, folks! DJ S-Goods is up and graduated, but DJ Deej and DJ Stretch are still here and back at it all summer long. The two talked about their plans for the summer concerning music, and what they have enjoyed about the releases so far this summer. Of course, Beyonce‘s Lemonade has been huge, but it is impossible to ignore the fact that Drake‘s Views outsold her album, going platinum in the first weeks an being streamed 1.4 billion times. For us as Canadians, this is certainly an accomplishment worth celebrating. DJ Stretch and DJ Deej differ on the tracks that they love the most, but they both agree that the album is very well produced as a whole. For those who don’t know, Deej follows the work of producer 40 very closely, as he also produces most of G-Eazy‘s work. 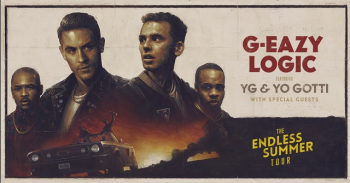 DJ Stretch and DJ Deej are heading to the Endless Summer tour with G-Eazy and Logic in July at the Molson Canadian Amphitheatre. These two will also be accompanied by Yo Gotti and YG. Free on July 24th? Make it an evening to remember and grab a ticket here. Stay tuned for more news, and a few hype interviews over the summer months. In fact, all Summer Sixteen. Tuesdays at 9 p.m. Tune in, and turn up.